If you’ve been to the electronics store recently, you’ve probably been boggled and intrigued with all the choices in HD (high definition) flat panel (flat screen) TVs these days. This guide will help you sift through the numbers and bring home the best TV for your needs. Super Sharp: LCD technology creates a very sharp digital image that is more highly defined than plasma, but also less natural looking. Brightness: Compared with plasmas, LCD TVs are brighter overall, making them easier to view in a lighted room. They also have less screen glare than plasmas, although different brands have different screen coatings. Thin and Lightweight: At just a few inches thick, LCD TVs are easily wall-mounted. They also come in the smallest sizes, with a range from 19” to 65” inches measured diagonally. Energy Saving: LCDs are more energy-efficient than plasma. Viewing Angle: LCD TVs are a little more difficult to watch at an angle. The color or sharpness can distort if you’re looking at it from the side. High Brilliance: LED TVs usually have sharper color and contrast than LCD or plasma TVs. Most Energy Saving: LED TVs are the most energy efficient of any TV. Very Thin and Lightweight: LED TVs are also thinner and lighter than LCD or plasma TVs. 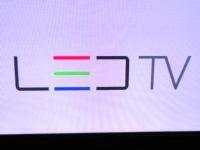 Longer Lifespan: LED TVs tend to last longer than LCD TVs. Larger Size: Plasma TVs have the largest screen sizes, starting at 42 inches. They’re also thicker than LCD TVs. Richer Colors and Deeper Blacks: While LCD TVs are brighter, plasmas have richer colors and deeper blacks, making them easier to view in a darkened room. Smoother Motion: Movement on screen is smoother with plasma TVs than LCDs. Plasma TVs are often described as more “film like,” often making them the first choice for home theater rooms and sports viewing. Wider Viewing Angle: Plasma screens have a wider viewing angle than LCD and LED TVs, so they’re good for viewing from the sides or from below. Use More Power: Plasma TVs consume more electricity than LCDs or LEDs. Resolution: Screen resolution is how many pixels, or crystal/gas units, are on the screen. Higher resolution means better picture quality. The most common resolutions are 720p (720 pixels high) or 1080p (1080 pixels high). While both are considered hi-def, 1080 is now considered the standard for HD television broadcasts and Blu-ray movies. Screen Refresh Rate: This is the speed at which the screen can refresh its pixels. Common refresh rates are 60Hz (60 times per second, the most economical choice), 120Hz (standard hi-def), and 240Hz and up (high-end TVs). Contrast Ratio: The contrast ratio tells you the whitest white and the blackest black that the TV can display. Static contrast numbers tell you the ratio the TV can display at the same time, while dynamic contrast gives the range the TV can produce. A higher contrast ratio is better, so 4,000,000:1 is better than 120,000:1. Measurements of contrast ratio aren’t standardized, making it hard to compare numbers. 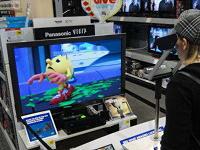 3D Display: Three dimensional technology adds realistic depth to the HDTV and is the newest rage. It requires a 3D capable TV, special 3D glasses, and 3D programming (such as 3D broadcasts, 3D DVDs, or 3D Blu-Ray disks). Internet Hook-Up: Some TVs now come equipped with a built-in Internet connection, either through a wired Ethernet cable or a Wi-Fi adapter (usually not included). With Internet connectivity, you can access online movies from websites such as Netflix, Blockbuster, Vudu, and Hulu. Most have a proprietary “Apps” interface, rather than full web browsing. Internet connectivity is already a common feature of Blu-Ray players and gaming systems, so if you use one of these devices, you may not need it on your TV. Computer Input: Some HDTVs have inputs for your computer, allowing you to use your TV as a large monitor. This is great for viewing photos, surfing the net, or watching videos from your computer. Other Inputs: Make sure the TV has enough ports to connect all of your gear. If you’re into gaming, DVDs, Blu-rays, and audio systems, be sure there’s room to connect everything. Some TVs even come with memory card slots and ports for connecting cameras. Screen Finish: Some HDTVs offer an optional matte screen finish that cuts down on glare and reflections.